La Mante (The Mantis) is a thriller/crime miniseries that originally aired on the national French TV channel TF1 and is now streaming on Netflix. It stars Carole Bouquet Do Not Disturb (2014) as an imprisoned serial killer, and Fred Testot Get Well Soon (2014) as her son who is compelled to work with her to solve the mystery of some murders. The first episode opens with a praying mantis in the foreground feasting on another insect, possibly a male praying mantis. This ‘on the nose’ type of symbolism is thankfully absent throughout the remainder of the episode. So what’s going down? Someone is committing grizzly murders and Superintendent Dominique Ferracci played by Pascal Demolon is tasked to do something about it. The style of the killings are reminiscent of the murders of the now in prison ‘praying mantis’…yes, she is called the praying mantis, though her real name is Jeanne Carrot. Since the mantis (played by Carole Bouquet) has been in prison for 25 years Ferracci believes there is a copycat running around out there. Upon hearing the news on her telly (the French really know how to treat their serial killers, her ‘cell’ looked quite posh) the mantis reaches out to Ferracci. “I can help you” her solitary message in the note she sends him reads. He pays her a visit and she tells him that she can help him catch this killer in exchange for a little freash air…and her sons’ assistance, which brings us to the hook of the show. Naturally, her son (Damien) wants nothing to do with her, hates her guts yada yada yada….pair them up and let the party begin. The show is painfully serious which doesn’t help when coupled with events that on their head are rather silly. I dare anyone to say: “I have to solve a murder case with my serial killer mom’s help” three times without chuckling. One scene, that I’m sure was supposed to be oozing with tension played out a little bit too long where I found myself bursting out with laughter at the hamminess of it. I also couldn’t really find a anyone to latch onto. Actor Fred Testot (Damien) plays his character with a pouty petulance that’s a bit off-putting. Pascal Demolon’s Feracci is a little better, but he’s more of a spectator in this piece and doesn’t really have much meat personality-wise. 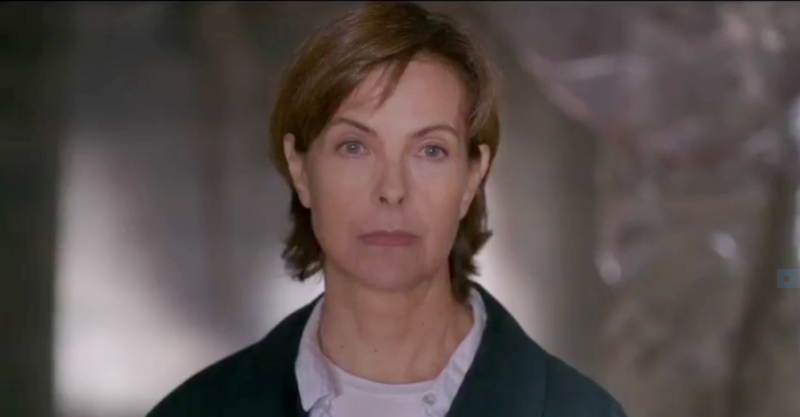 This leaves Carole Bouquet’s Jeanne, who they seem to have given the best lines to. Unless the men she killed were secret alien invaders I’m not sure why I would want to root for her despite being corralled in that direction by the show. Bouqet plays Jeanne with cold stoicism throughout the ep, which might have given her a distinct menace from the rest of the cast save for the fact that most of them also played their characters with cold stoicism, the only difference being some interjected their portrayals with moments of puzzlement usually indicated by the raising of an eyebrow. This might very well be a French thing, who knows, I’m just a vulgar Yankee. They did do a good job portraying the copycat killer (or at least who they are alluding may be the killer). I received a grade-a wacko I-touch-myself-while-I-kill-vibe coming from them loud and clear. Definitely a good character to root against, so there’s that. Near the end the episode gives hints that there may be interesting twist and turns in the show’s narrative and in the long tradition of episodic television, the cliff hangar at the end is designed to keep you around to find out what happens next. As it stands quality-wise, I recommend that if you’re into dry French procedurals and have a fair bit of time on your hands to spare, La Mante should serve your needs. Otherwise, rewatch The Killing or The Fall.